Some predict earthquakes, others giant meteors, but we all know how the world will end, at least for humanity - robots. First they'll take our jobs, then they'll take our lives. Hey, it's evolution, baby, and for those complaining that the human gene pool needs a little more chlorine, well, Skynet has just the thing. But even as they rip us to shreds, we'll still love them. They've dominated our science fiction for 60 years, both as beloved partners and impending destroyers. It seemed only fitting to do a list of my favorite action figure versions. That's an important distinction - these are my favorite ACTION FIGURE versions. These are NOT my favorite robots, although some of them are here. Some of these wouldn't get close to my top ten robots list however, and some of my favorite robots, sadly, have never gotten a great figure. But what is a 'robot' for the purposes of this list? I defined it pretty simply - it's all about the brain. If they have a synthetic brain, even if they have other fleshy parts, they're a robot. If they have an organic brain, even if everything else is cybernetic and mechanical, they're not. I also stuck with licensed characters. 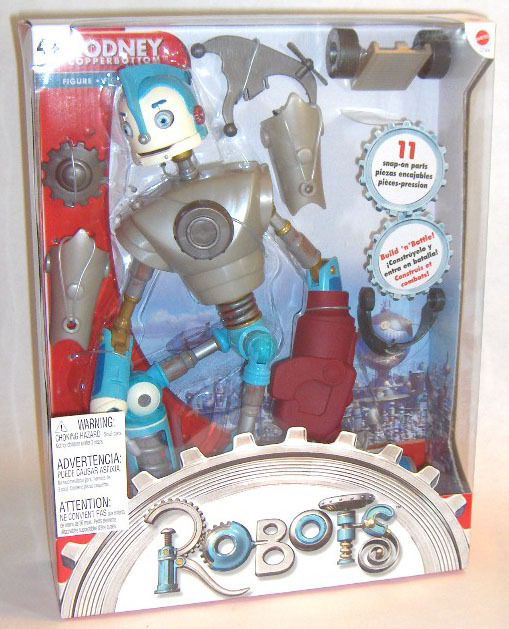 There are plenty of robots out there that are unique toys created just as toys - think Robosapiens or Meccanoid. But I decided to stick with characters from films and TV that have been translated to toys. There's also about two billion different Japanese robot lines. There's a people that really love their robots. Sadly, I'm just not well enough versed on the majority to make good, informed picks from the plethora, so I'll leave that to my readers to correct me and tell me which ones I missed. You're going to see some big names missing from this list. Some are because they don't fit the above rule of what I'm calling a 'robot'. Some are missing simply because they have never had the sort of great figure I think they deserve. Hopefully, that changes at some point. Some are also missing because I decided not to go too heavy on any one license. Yea Star Wars, you know I'm looking at you. Without even thinking about it, I was able to come up with six figures I could easily put on this list. I decided to limit that to two only, so you're definitely going to see some missing Star wars droids that you'd include. Now let's get to those 'bots! Futurama is a fantastic show. And of course, there's been LOTS of robot characters turned into plastic icons, from the Robot Devil to Robot Santa to URL to Calculon to Roberto. 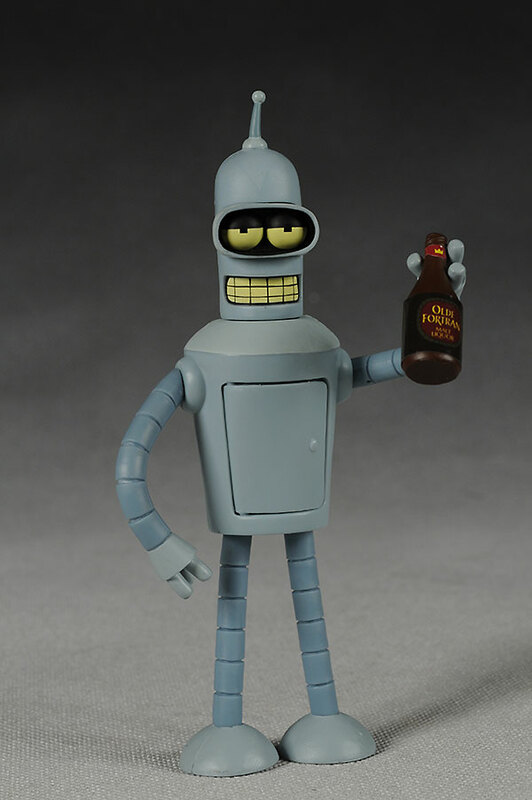 I love them all, but Bender is king, and he also had that little somethin' somethin' that sets him apart from your average robot action figure. They did a bunch of versions, including the uber-cool Wooden Bender, but I'm going with Toynami's original release for the list. The special feature that sets him apart over the usual Eradicator or Brainiac figure is those eyes, baby, those eyes. He came with swappable eyeballs, allowing you to go from angry to happy to intoxicated. The other accessories are great as well, but it's the ability to alter his expression that got him on this list. Chalk the inclusion of this next guy up to my disappointment in not getting him when I had the chance. I love the movie, and out of the various toys, the easy winner was the large 'build n' battle' version. He came with almost a dozen different parts that you could snap on and off, customizing your own Rodney. I picked this guy up off the shelf repeatedly at the local Toys R Us, and never quite committed. Sadly, the moment has long passed, and this figures cool factor, along with a improving attitude toward the film over time, has pushed his prices on ebay to a $100 or more. 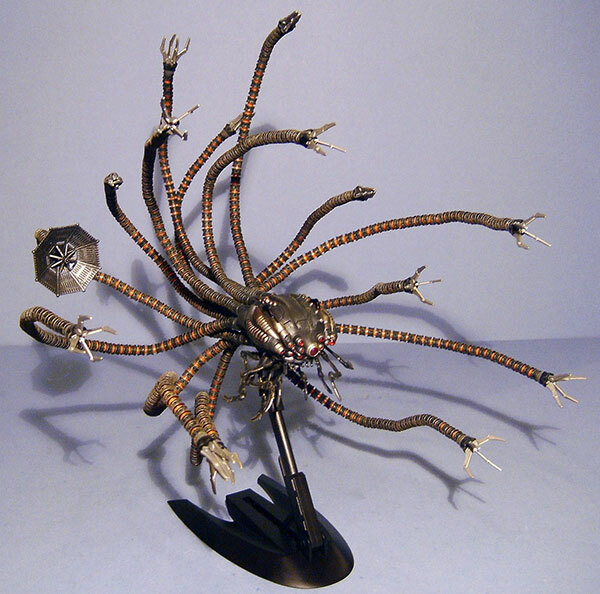 The evil, controlling, deadly Sentinal from the Matrix films was produced more than once. McFarlane did a terrific job with theirs, but Hot Toys came along a few years later and upped the ante with their release. Seems like a common theme, no? This guy is another one going for pretty big bucks these days. Ashley Wood's World War Robot graphic novels spawned this terrific series of figures. threeA has produced figures in 1/12 scale as well, but the one I'm talking about here is their Large Martin in 1/6th scale. This thing is gorgeous, with a lot more articulation than you might expect. He could use a couple more accessories, but the paint and sculpt are just outstanding. He was expensive 8 years ago - it hasn't gotten cheaper . 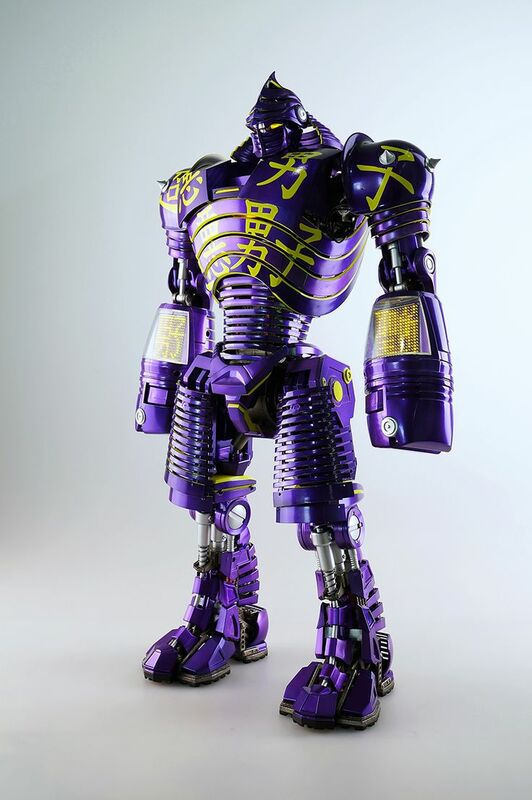 It's sort of a given in the industry that if you want great looking robots, go to threeA. When they announced they were picking up the Real Steel license (aka "Rocky Meets Rock-em Sock-em Robots") I knew it would turn out great. They did the main character, Atom, as well as Ambush and Midas. But it was Noisy Boy that really caught my eye, thanks to his fantastic color scheme and terrific armor design. 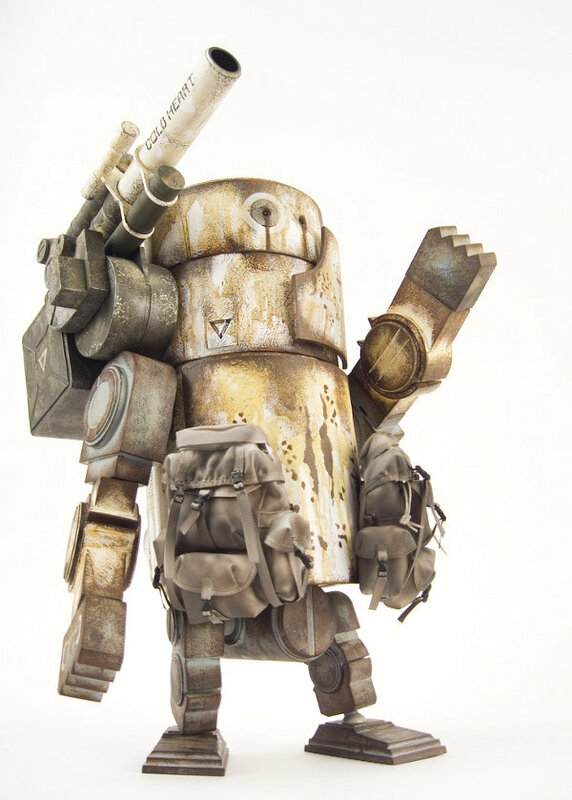 ThreeA knows how to do robots and armored figures - it's their thing. This license might not be one that got people's gears turning, but for fans, it didn't disappoint. Further proof of folks figuring this out, but sadly too late, is the doubling of the price on ebay. Sideshow always gets a lot of flak - it seems like they're an easy target. 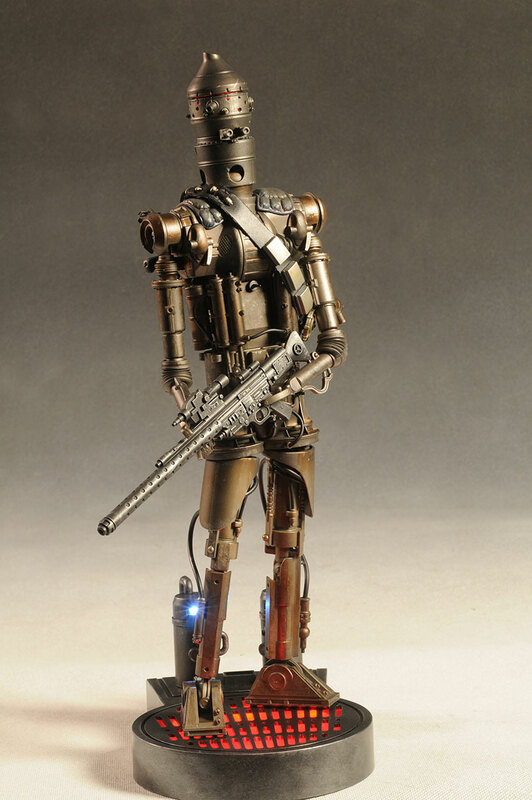 But they have produced some fantastic figures over the years, and one that stands out is their sixth scale IG-88. He has a cool light up feature of course - what decent robot doesn't? But it was their design of the articulation that really put this guy over the line. The on screen design was always high on my list, and Sideshow crushed it with their execution on a very tricky character. I wish there were more great action figure representations of old school robots, but they're aren't. I almost added Gort to this list, but while I love the character, the figure isn't anything special. And while Robbie was a fantastic design, I don't know of any terrific figures of him. But we have gotten a few nice B-9's. 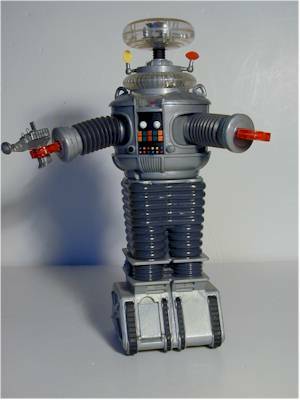 If you're unaware, this is the robot from the classic television show Lost In Space. Trendmasters did a 1/8th scale version around the turn of the century, and it's easily my favorite. Great lights and sounds, and even action features like pop out arms and rolling treads (pull him back for forward movement!). Hell, there's even the soil sampling door on the front of the tread box. The rest of the classic Trendmasters line left something to be desired, but this guy was outstanding. The prices on ebay have stayed cheap with this guy, and I recommend picking one up if you're a fan of the old show. At least until someone does a proper 1/6th scale version, anyway. Oh, I know - this isn't the droid you were looking for. 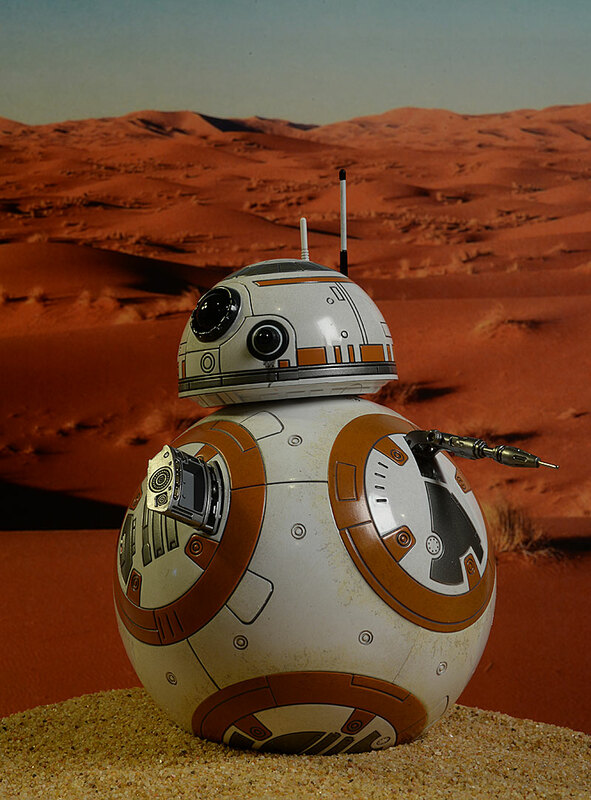 But BB-8 is cute, smart, and looks great in this Hot Toys release. He has the usual add on accessories, he has the required light up feature, plus he has something no other action figure has ever had. Through the ingenious use of magnets, you can roll him on the floor and the 'head' will stay upright, sliding along the outer skin! I was blown away by the creativity when I first opened this figure up, and he remains a terrific example of what 'toy' manufacturers can do when they set their minds to it. You knew a Terminator HAD to be on the list, right? It is perhaps the robot with the most action figures produced, in just about every scale and every style. There's the T-600, the T-700, the T-800, etc. etc. etc. You could do a list of the top ten Terminator figures, and you'd have plenty to choose from. Hmmmm, maybe I'll do that...for the purposes of this list, I stuck with one - my favorite, of course. I suppose that's a spoiler for any Top Ten Best Terminator Figures list! 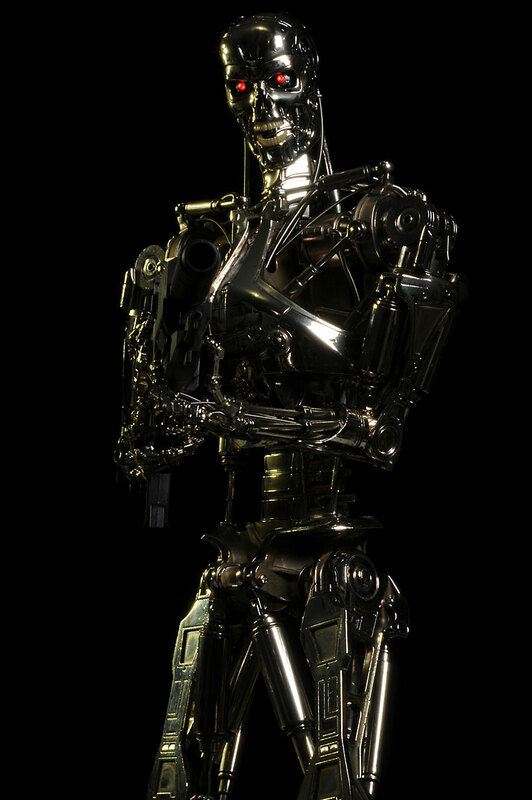 It's the 1/4 scale Endoskeleton from Hot Toys. Light up feature? Check. Great sculpt? Check. Amazing engineering of complex articulation? Check. Use of metal parts where possible? Double check. This is a really impressive figure on the shelf, and the fact that it's highly posable - unlike a Premium Format statue, for example - makes it all the better. Considering our fear of our destruction at the hands of robots, it seems nice that my top choice is a sweet, lovable robot that ends up saving all of humanity instead. 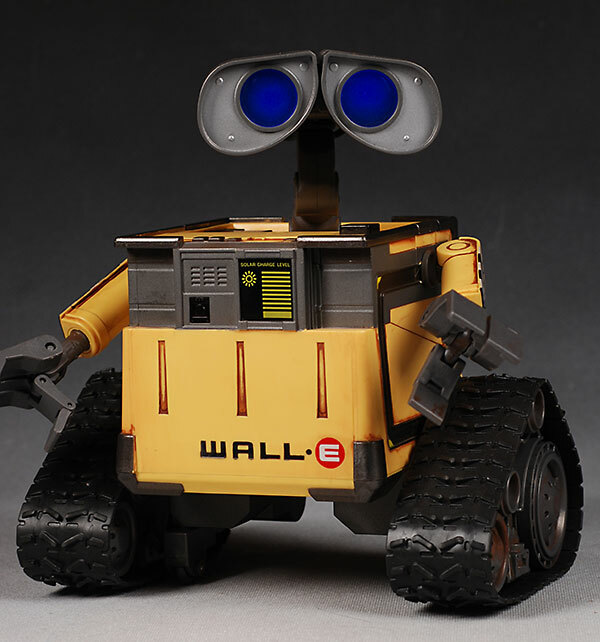 I loved the Pixar film Wall-E, and Thinkway Toys (who had done some amazing work on previous Pixar film toys) hit a grand slam with their various electronic action figures based on the main character. There were plenty if different types, but it was the U-Command that I really love. Some people will say 'but it's an RC!' and yes, he sorta kinda is. But he's also a great action figure, one you just happen to control with a remote rather than with buttons on his body. This was a tremendously popular release back when the movie was out, and over time prices rose on ebay. But Pixar was smart enough to re-release him as part of their umbrella toy line, and you can probably still pick him up at a local Toys R Us. When I first started working on this list, I thought I'd have few choices, which always worries me. 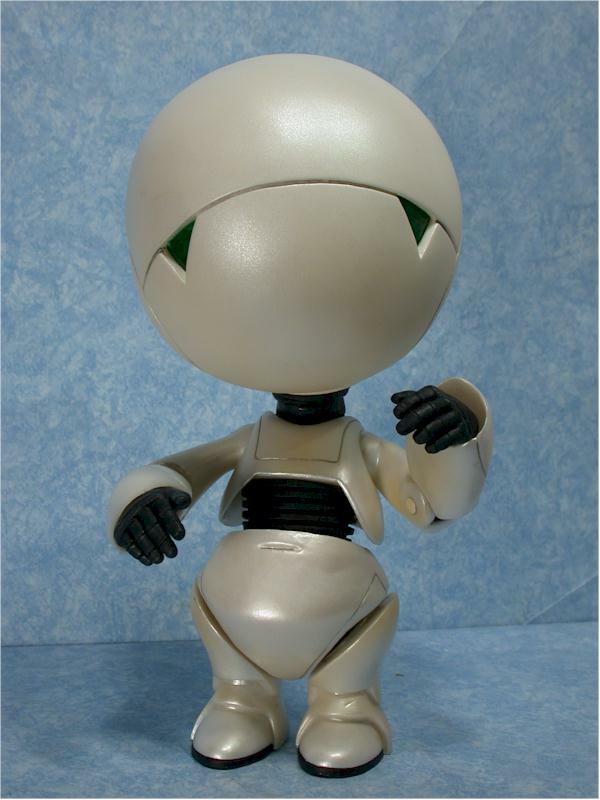 I mistakenly thought most 'robot' figures were really cyborgs of some sort, humans with added abilities. I was thinking about everything from the Six Million Dollar Man to Darth Vader to Robocop to General Grievous, all cybernetically enhanced to some degree...and not qualified for this list. And then I thought about it for 30 seconds and realized - my God, there's a ton! I had to cull some great characters, like Data, Brainiac, or Robbie, simply because they'd never really gotten an outstanding figure. I also didn't want to over load the list with Star Wars droids, and while C-3PO, R2-D2, the Battle Droids, and even the Probe Droid have had some great figures, I thought the BB-8 and IG-88 were better overall. I'm also betting there's more than a few great ones I've forgotten. Let me know what your list would look like!